It is no secret that Americans love hybrid cars. According to Statistic Brain, an estimated 2,180,000 hybrid vehicles were sold in the U.S. in 2012, with almost 210,000 of them being Honda Civic Hybrid models. These hybrid cars can be incredibly interesting as they’re different than the traditional cars in many parking lots nationwide. 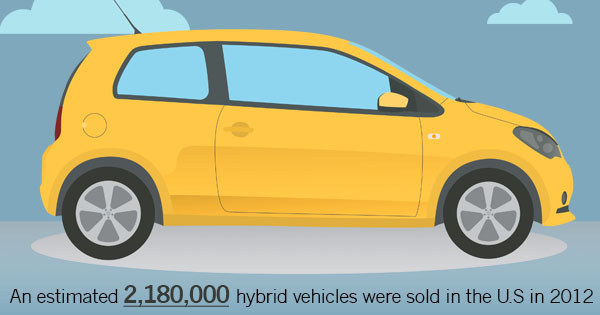 Here are some fun facts about hybrid cars. Fuel economy is the relationship between a vehicle’s fuel efficiency and the amount of fuel consumed by the vehicle. Because they do not run solely on gas, hybrid cars’ fuel economies are between 20 to 35% more efficient than traditional gas powered vehicles. Typically, hybrid cars can switch between running on gas to running on hybrid batteries. This will save the driver an incredible amount of fuel, and will prevent any breakdowns or stalling if you accidentally run out of gas. For example, if you are on the highway, your car will run like any other traditional gas powered car. But if you are stuck in city traffic, then your engine will shut down and your car will run off of its hybrid battery. The U.S. government supports hybrid car owners by giving them a tax write-off once a year for saving the environment. All in all, this can save a hybrid driver about $3,400 in tax savings annually. Hybrid cars have less of a depreciation rate, making them better investments. They also typically have a longer warranty period. Even though hybrid vehicles typically cost on average 15 to 25% more than traditional vehicles, the cost is regained many times over with all the money saving benefits you’ll receive. In general, hybrid cars are built to last. Manufacturers use incredibly durable parts, which means less wear and tear and replacement costs down the line. The hybrid car battery also comes with its own longer warranty period of eight years. If something happens and you need to replace your hybrid car battery, make sure to call our professionals at Bumbleebee Batteries today!